one, two, and three bedrooms with amenities including Free basic cable, Air Conditioning, and much much more! Vista Del Sol is a Ray of Sunshine, tucked away on a residential street, with easy access to all major freeways. You'll be connected to work, restaurants, entertainment and more. We offer quiet classic living in a unique friendly community; spread out over 4 acres of beautifully landscaped grounds. This large open tree covered community that includes swimming pool, and carport parking with gated access. Our spacious apartment home floor plans offer many stylish and unique one, two and three bedrooms. Live smart and love life in this top-of-the-line apartment! 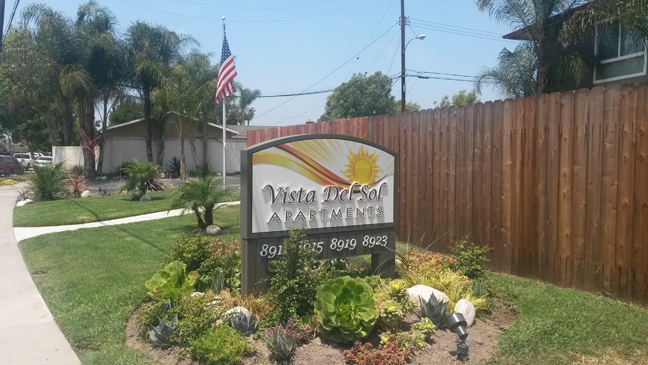 Come home to comfort at Vista Del Sol Apartment Homes. We are also pet friendly! What's not to love? Call now to schedule a personalized tour of our community. To see a video of one of our units click here. ..